Every day, Watch This offers staff recommendations inspired by a new movie coming out that week. This week: It’s Comics Week at The A.V. Club, and because we’ve already highlighted superhero movies and comic-book adaptations that aren’t about superheroes, we’re using the next five days to single out films whose imagery, storytelling, or themes are influenced by comics. The Adventures Of Buckaroo Banzai Across The 8th Dimension may not have been based on prior source material, but it wears its comic-book influence on its puffy-jacket sleeve. That’s most apparent in its out-there story, about a scientist-samurai-rocker-celebrity named Buckaroo Banzai (Peter Weller, always unflappably cool) and his ragtag team of sidekicks, The Hong Kong Cavaliers. In an attempt to avert nuclear war between the U.S. and the Soviet Union, the heroes join forces with a race of Planet 10 aliens to stop rebel extraterrestrials from unleashing their evil leader. Those mutant-frog-faced villains (including ones played by Christopher Lloyd and Dan Hedaya) are led by crazed scientist Dr. Emilio Lizardo (John Lithgow) and employ slimy bio-tech gadgets that would be perfectly at home in a David Cronenberg film. Yet far from a body-horror effort, W.D. Richter’s film is all gonzo cartoonish craziness, from its wild plot twists to its stylish visuals, which routinely capture the look and feel—and the anything-goes, whiz-bang spirit—of colorful comic-book panels set in motion. 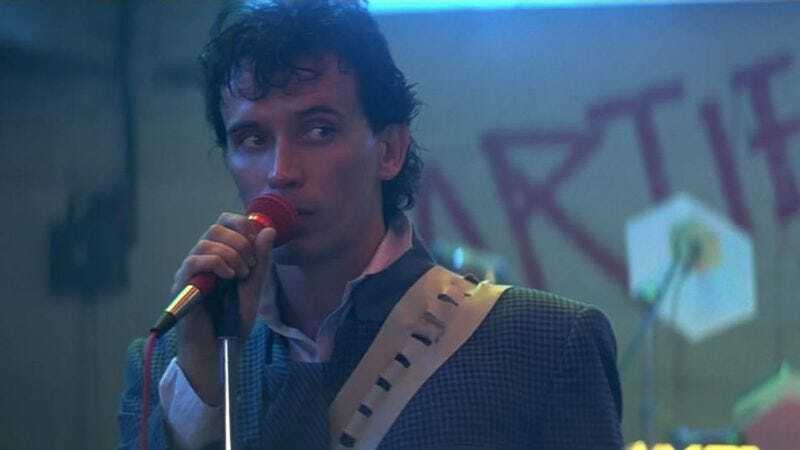 Heavy on narrative curveballs and laid-back slacker attitude, Buckaroo Banzai affects a tongue-in-cheek lightheartedness that makes it more of a comedy than an action-adventure—this despite the fact that Richter routinely interrupts his tale to indulge in shootouts and vehicular chases. Why Jeff Goldblum’s neurosurgeon wears a cowboy outfit, or why Ellen Barkin’s Penny Priddy looks exactly like Buckaroo’s former love, are merely some of the film’s deliberately baffling elements. (Earl Mac Rauch’s script is stuffed full of exposition and yet routinely explains nothing.) The result is a breezy saga that grooves along on its own idiosyncratic wavelength, reveling in one fantastical notion after another without much care for whether its various parts cleanly fit together. Ending with a textual coda that teases further installments to come (a promise that’s yet to be fulfilled), it’s a cult classic specifically crafted with comic-book fans in mind—complete with a hero who, among his many titles, is also revealed to be the star of his own Marvel Comics series. Availability: The Adventures Of Buckaroo Banzai Across The 8th Dimension is available on DVD, which can be obtained from Netflix, and to rent or purchase digitally through Amazon Instant Video.